The CVO™ (Custom Vehicle Operations) model line here at Riverside Harley-Davidson® is the premier line of custom motorcycles from Harley-Davidson®, and the CVO™ Street Glide gets premium materials, high-tech features, and plenty of custom details for the 2017 model year. 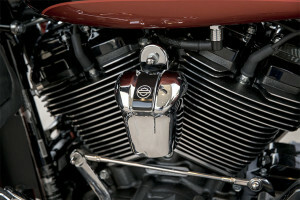 It also gets a new Milwaukee-Eight™ 114 v-twin with more power than ever. 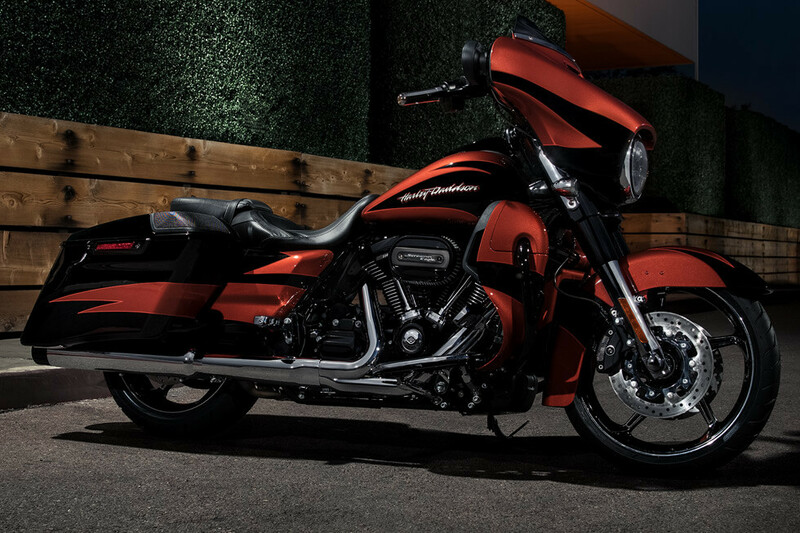 It’s a bike like nothing you’ve ever ridden, but you can climb aboard the CVO™ Street Glide now here at Riverside Harley-Davidson®, the Inland Empire area Harley-Davidson® dealer. 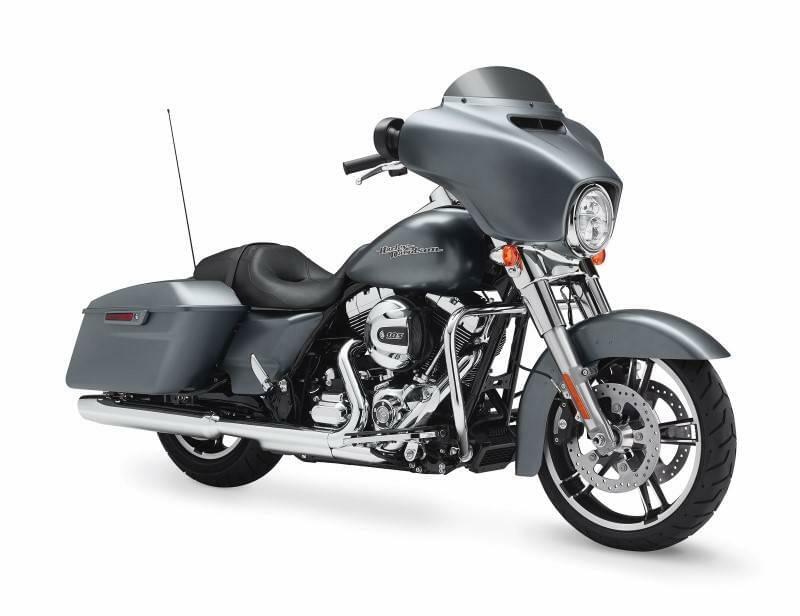 The CVO™ Street Glide® is built to provide you with mile after mile of smooth and confident cruising. Once you’re in the saddle, you’ll find a wealth of smart features to enhance your handling, control, and overall ride quality. 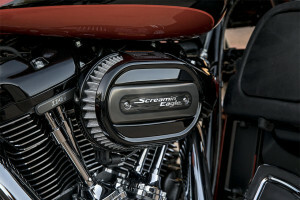 Milwaukee-Eight™ 114 V-Twin Engine: Harley-Davidson® listened to riders and engineered a new family of engines that deliver more power, quicker acceleration, greater fuel economy, cooler and smoother operation, and even more charging for accessories. 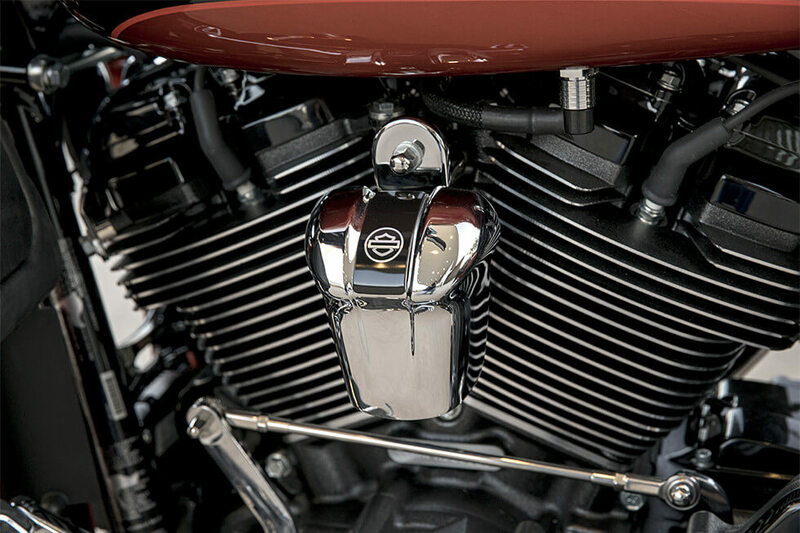 The new Milwaukee-Eight™ is the latest and greatest in a long line of iconic engines. 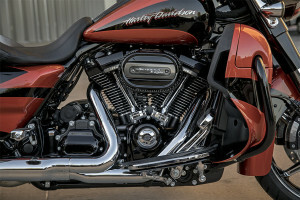 Milwaukee-Eight™ Overview: To achieve so many advances in a traditional air-cooled v-twin, Harley-Davidson® bumped up displacement and compression ratio to boost horsepower and fuel economy. 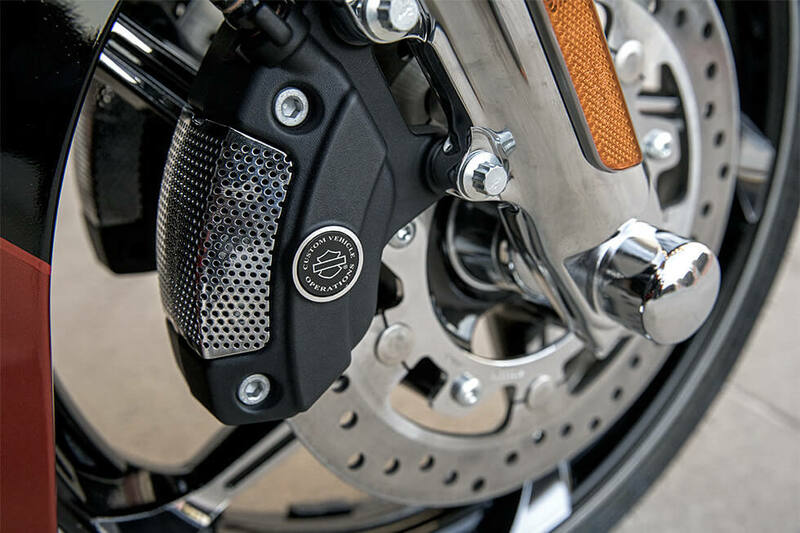 A counter-balancer and rubber mounting help smooth out the ride, while improved cooling and exhaust reduce riding temperature. Even the exhaust note is carefully tuned to provide pure sound. Brembo® Brakes: These high-performance brakes provide the responsive stopping power you need. With dual rotors up front, the front and rear 4-piston brakes are sure to boost your confidence wherever your ride takes you. Dunlop® Multi-Tread™ Tires: Superior traction and grip make the standard Dunlop® Multi-Tread Tires perfect for the long haul. They’re also exceptionally durable, which is good news for any rider. Electronic Sequential Port Fuel Injection: Efficient performance is enhanced by Electronic Sequential Port Fuel Injection. This system features heated oxygen sensors, which help keep emissions low, and maybe best of all, you’ll find that it requires less regular maintenance than a carburetor. Premium Touring Shocks: The single tube, nitrogen charged emulsion shocks are just about the best shocks available for a touring bike. These premium shocks work to improve handling while giving you reliable cushion and comfort no matter what condition the road is in. 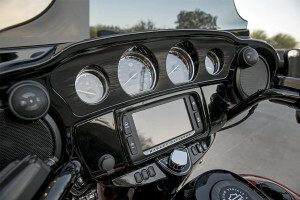 Fairing Mounted Instruments: All of the gauges are displayed conveniently in the fairing. Speedometer, fuel gauge, gear indicator, trip meter, cruise control, and more are all easy to locate and simple to read. Slip and Assist Clutch: The hydraulic slip and assist clutch reduces the effort required to shift gears. That’s especially important if you’re stuck in a lot of stop-and-go traffic. 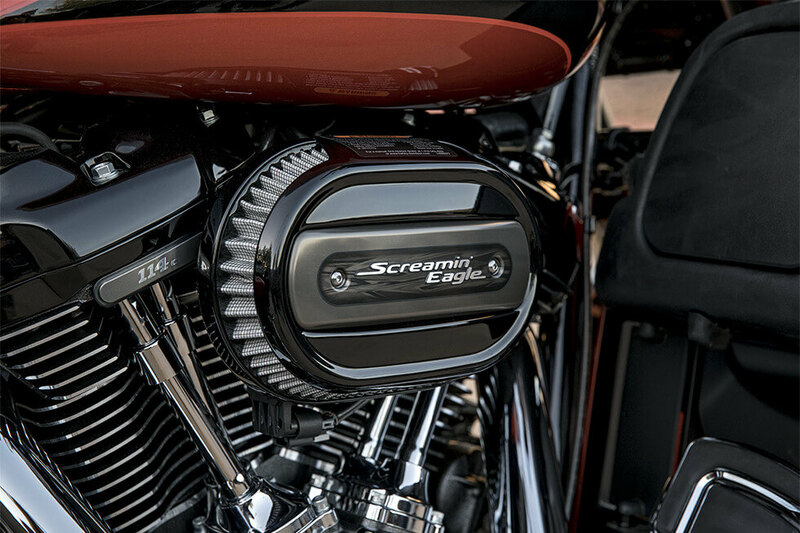 Ventilator Elite Air Cleaner: It’s important that the powerful Milwaukee-Eight™ gets plenty of air, and the Ventilator Elite Air Cleaner makes sure that potentially harmful dust and debris don’t get in. Ergonomic Hand Controls: The comfortable, ergonomic design of the hand controls is something that you’ll appreciate on those long rides. 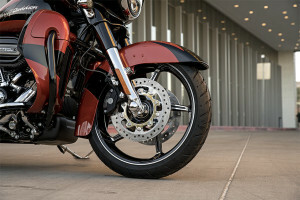 Reflex™ Linked Brakes with ABS: The advanced ABS features Reflex™ Link Brakes that will keep the wheels from locking up, giving you superior stopping power in all conditions. 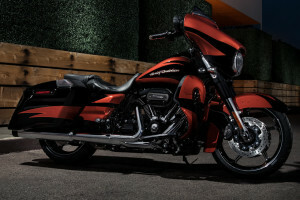 Six Speed Cruise Drive: Smooth, quiet shifting is all you can ask for from a transmission, and the six-speed on the CVO™ Street Glide® reliably transfers all that big Twin Cam power directly to the wheels. Steering Head and Front Forks: The large steering head and big front fork are strong and sturdy. Improved damping allows you to ride in comfort with the confidence that comes from solid, sure handling dynamics. New LED Bullet Turn Signals: The bright LED bullet turn signals give you the visibility you need, and they look great cased in chrome. It’s just another way the CVO™ Street Glide® shows off its classic yet contemporary style. 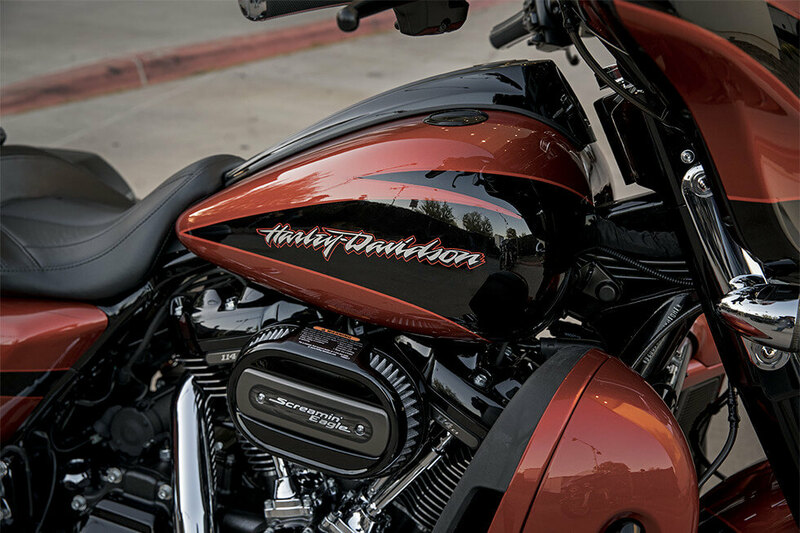 You get premium Harley-Davidson® custom style and top-quality features when you choose the CVO™ Street Glide®. Chrome Tank Console: The tank console, set in pure chrome with eye-catching custom inserts, is both classy and classic. 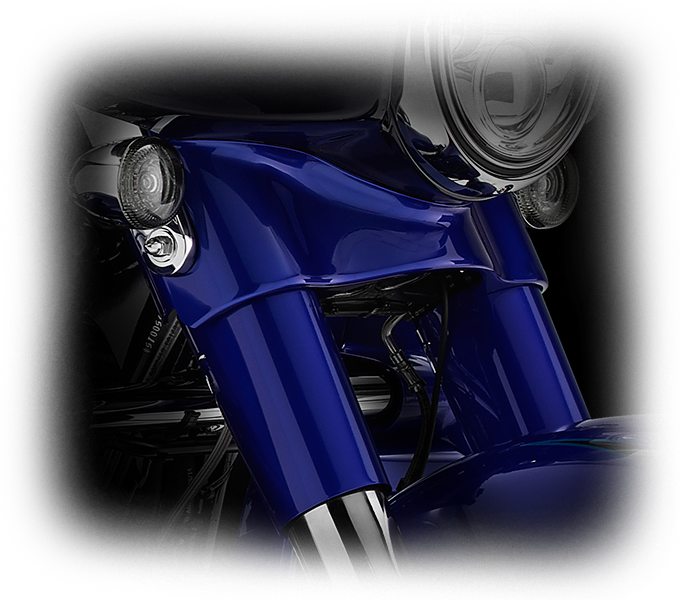 Color Matched Components: Meticulous attention to details gives the CVO™ Street Glide® a truly unique look. Components like the fairing skirt and the fork and slide covers are color matched for a truly premium style that’s hard to miss. Gloss Black Inner Fairing: The inner fairing sports a deluxe glass black finish, which is the perfect background for the gauges and infotainment screen. 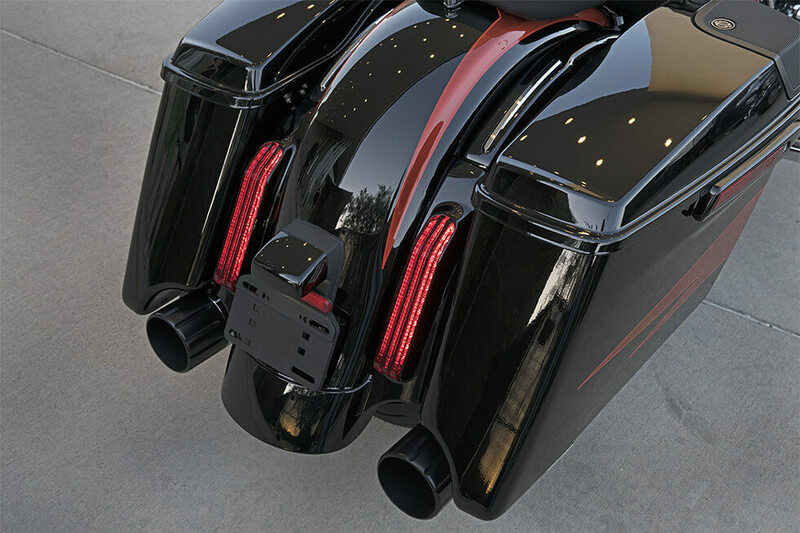 LED Brake and Turn Signals: Brake beams and turn signals provide brilliant LED illumination while also adding to the overall classic bagger style. Derby Cover and Insert Design: The new derby cover and insert adds both custom flare and increased leg room, giving you style and comfort. 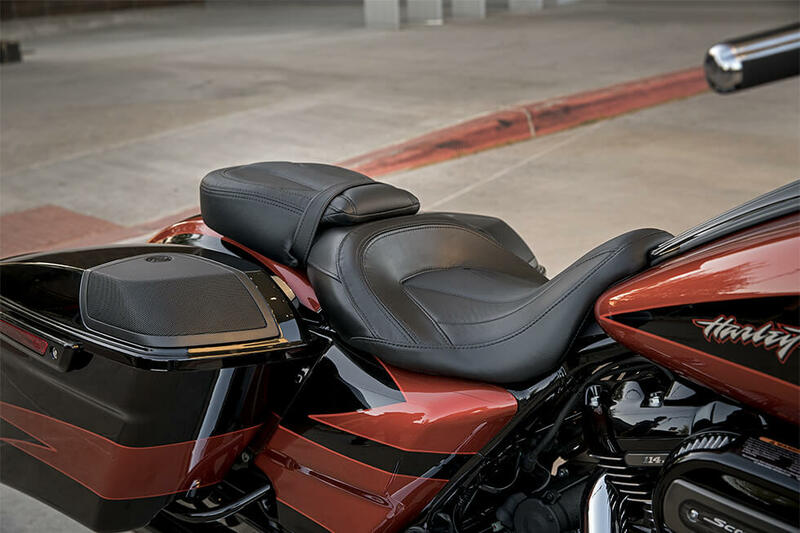 Custom Low Profile Two Piece Seat: Neatly designed with custom stitching and leather inserts, the low profile two-piece seat is yet another example of the high-quality craftsmanship offered with the CVO™ Street Glide®. 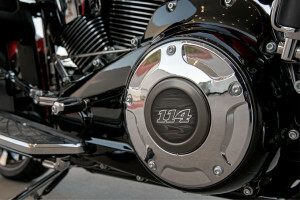 Paint and Graphics: The high-impact paint and graphics are applied by hand for a unique custom look and finish that’s sure to command a ton of attention. 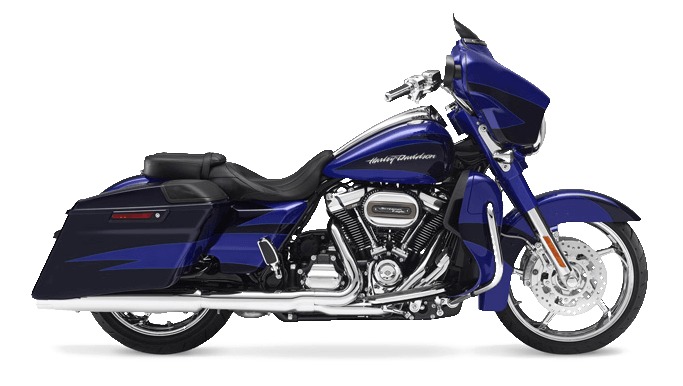 With four color schemes to choose from, you can have your CVO™ Street Glide® decked out just the way you like it. 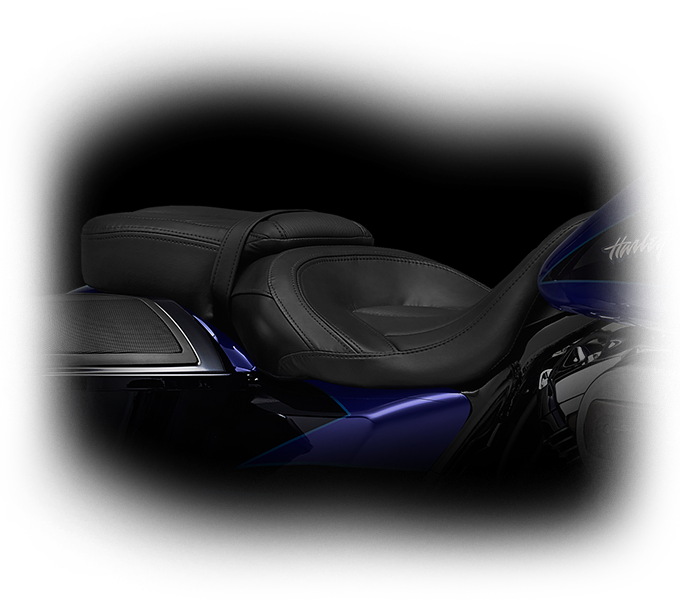 The CVO™ Street Glide® is loaded with top-shelf, premium features to provide you with that custom feel and ease of control that adds quality to your riding experience. One Touch Fuel Door: A quick touch pops open the fuel door. Just that simple. Battery Charging Harness: A battery charging harness is a convenient and must-have feature on a touring bike, and you get one as standard equipment with the CVO™ Street Glide®. Two-Up Seating: Designed for comfort, the low, two-up seat sports fine-crafted styling with a narrow neck and deep bucket. Both you and your passenger will be riding in the lap of luxury. Wide Set Handlebar: Ergonomically designed, the wide set handlebar lets you settle into a comfortable riding posture without any stress or strain. Extended Saddlebags with 5”x7” Boom!™ Speakers: The roomy saddlebags contain 5”x7” Boom!™ Speakers for full stereo sound. 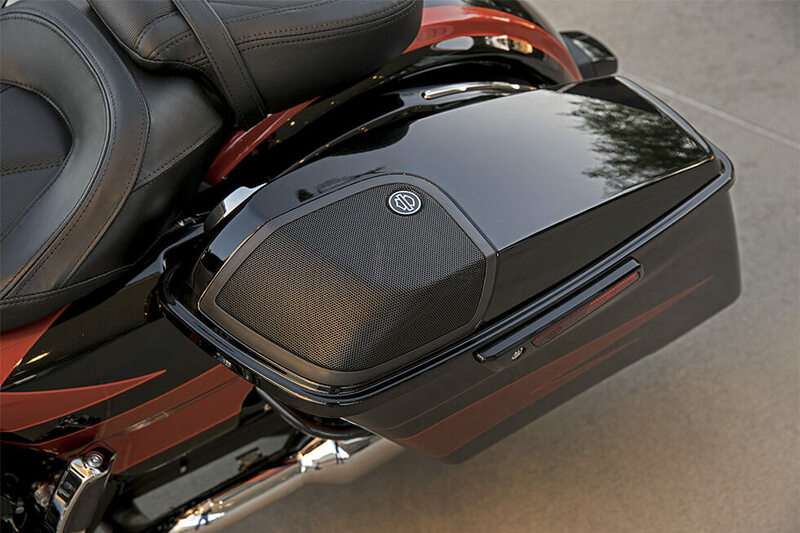 The saddlebag design is slick and classic, showing off that big bagger style, and the handy carryout liners make them easy to unload. High Output Accessory Connector: Conveniently add accessories like a heated vest, heated seat, or heated hand grips with the standard High Output Accessory Connector. 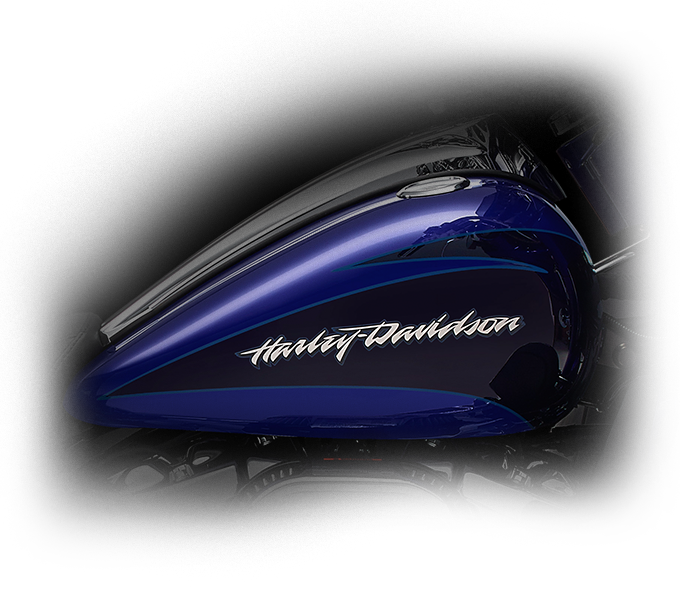 Airflow Collection: The wide array of Airflow Collection custom features includes full-length rider footboards with heel/toe shifters, adjustable passenger footboards, engine guard, and more! 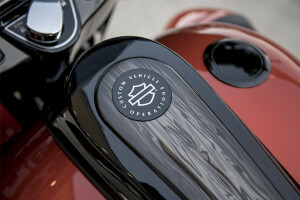 One-Touch Design Philosophy: All storage compartments, saddlebags, and even the fuel door feature the unique one-touch opening design. This makes access easy even when you’re wearing gloves. 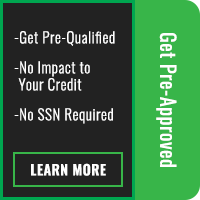 Keyless Ignition Fob with Integrated Security: Convenience and security is provided with the innovative keyless ignition key fob that features automatic locking. Color Matched Slipstream Vent: The slipstream fairing vent not only adds to your comfort, its matched color and aerodynamic design contributes to the bold styling of the front end of the bike. 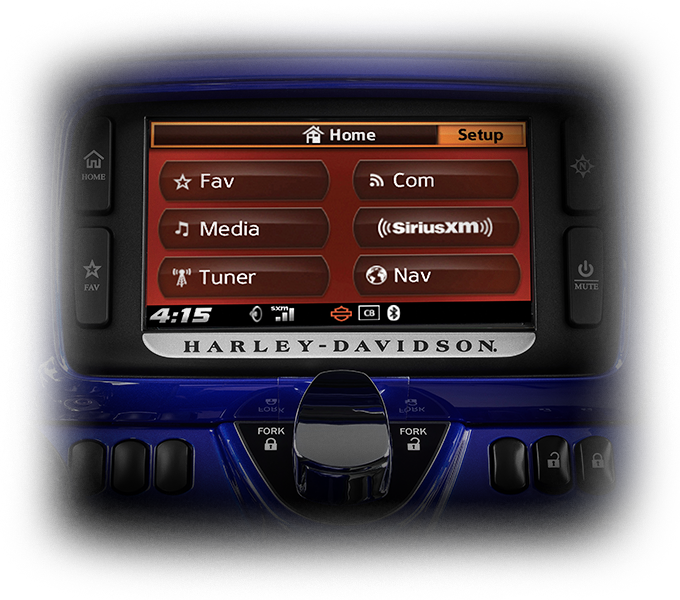 You’ll be able to stay connected wherever you ride with the advanced infotainment features you’ll find on the CVO™ Street Glide®. Tire Pressure Monitoring: The all new Tire Pressure Monitoring system is not only convenient; it’s also an important safety feature, letting you know immediately when your tires are over or under inflated. 6.5-inch Color Touchscreen: You’re in control of all of the infotainment features with this big 6.5-inch color touchscreen. This display is easy to read and operate even when you’re wearing gloves. 6.5-inch Boom!™ Stage II 3-Way Speakers: These large and powerful speakers are fully encased and capable of providing the clear, clean sound you can enjoy on those long rides. Custom Tuned Static and Dynamic Equalizer: The audio system is designed to work specifically with motorcycles, and with the Custom Tune Static and Dynamic Equalizer, you’ll get the clear sound you want at any speed. Dedicated 300 Watt Front Amplifier: There’s a lot of noise out there on the road, but with the big 300-watt front amplifier, you’ve got plenty of audio power and volume to enjoy your own soundtrack. Jukebox with USB Port: You can easily plug-in your iPhone, iPad, or other compatible devices for instant use and charging through the Jukebox with USB Port. Voice Recognition and Bluetooth: Make phone calls, send text messages, and control infotainment features all by simple voice commands, so you can keep your eyes on the road where they belong.